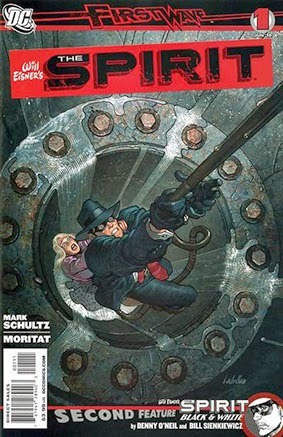 • PLOT SUMMARY: The Spirit returns in an all-new ongoing series! Central City destroys everyone who lives within its borders... so it's a good thing The Spirit already died once! International crime syndicate The Golden Tree wants to help Central City's Octopus consolidate control over the underworld and the Spirit is the kind of mess the Golden Tree was created to clean up. They've offered the Octopus the services of one of their finest assassins to take his breath away for good - and the sight of this killer would get anyone's heart pounding! This issue also features the debut of the eight-page THE SPIRIT: BLACK & WHITE co-feature, showcasing the industry's finest talent. And who better to kick things off than DENNIS O'NEIL and BILL SIENKIEWICZ. Written by MARK SCHULTZ – Co-feature written by Dennis O'Neil – Art by MORITAT Co-feature art by Bill Sienkiewicz. Cover art by José Ladrönn.